An interactive musical jet engine. The Turbinophone is an interactive art installation that allows you to play music with a jet engine. It is built from the compressor section of a J79 turbojet engine. Prior to singing its musical tones, this engine used to scream across the sky in an F-4 Phantom, propelling the aircraft to speeds over 1400 miles/hour (Mach 2+) using 17,000 pounds of thrust. The Turbinophone was first exhibited at Burning Man 2013: Cargo Cult. It was located deep in the desert, where curious participants discovered how to play this instrument. The Turbinophone is played by participants dropping steel ball bearings on the blades. As the balls bounce down through the engine, they strike the blades, which ring like tuning forks. As the ball bearings fall down through the engine, the blades get shorter and shorter, and the pitch of each blade increases. Kunal Dovedy is an interactive artist from San Francisco, CA. He enjoys creating art that provides an environment of creativity and connections between people. He loves music, aircraft, and most importantly, making! 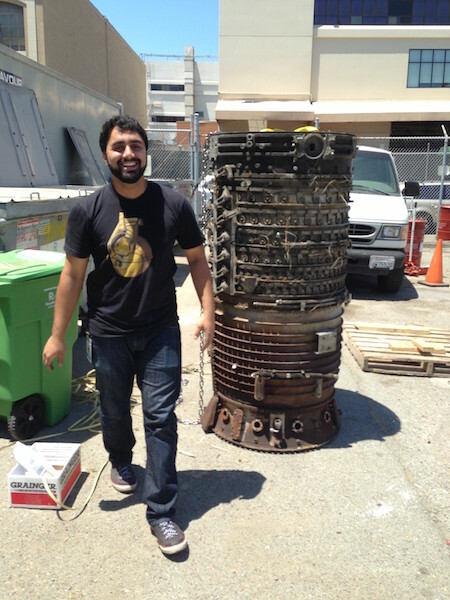 The Turbinophone is Kunal’s first large scale public interactive art installation. This page serves as a BIG THANK YOU to everyone who has contributed in some way, big or small, to the creation of the Turbinophone. AgentJayZ for providing the J79 compressor section! Oakland Aviation Museum for giving the Turbinophone a great home to delight people! Techshop San Francisco for helping me learn and build everything here. Please use the button below to get in touch with me.